You’ve been practicing your ghastly wail. You’ve been honing your haunting skills. You’ve even been sneaking around the house, flicking the lights on and off to create a creepy countenance at your place. You’ve even considering ghosting a few friends, just to freak them out a little this Halloween. Yes, you’ve been preparing to be the perfect ghost this year. You’re completely ready to haunt your friends and family, but aren’t you forgetting something? You aren’t actually a ghost just yet and you probably want to continue living, so becoming a ghost the natural way is totally out of the question. You need a costume! Well, we’ve scoured the earth to find the best ghost costumes and we’re here to present a rather revolutionary idea. The costume poncho. You read that right! The glorious poncho! Yes, the costume poncho is the easy and comfortable way to costume this year and this Ghost Poncho presents the perfect way to put your ghosting skills to good use. It’s a great way for you to get into costume for an affordable price. 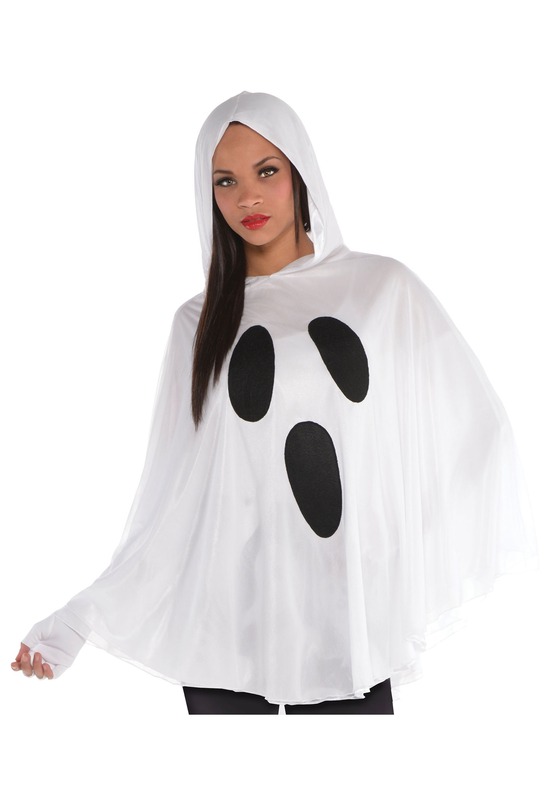 This ghost poncho costume is a simple piece that can be worn over most outfits to turn you into a lingering soul quickly and easily. The poncho is white and has an attached hood, which is both spooky and function. Just flip it down when you want to have a more casual look and put the hood on when you want to go full scary-mode. The front of the poncho has printed black eyes and a large mouth. Whether you’re looking for a simple outfit that you can wear to a costume party, or you’re trying to get spooky with your everyday kind of attire, this costume poncho is a great choice. You can even pair it with some of our ghost accessories, like our cream makeup sets or a spooky wig!